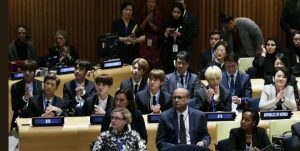 Korean global boy band, BTS, became the first ever K-pop group to address the United Nations in NYC on Monday. The band sends a powerful message to young people of the world to love themselves and speak. 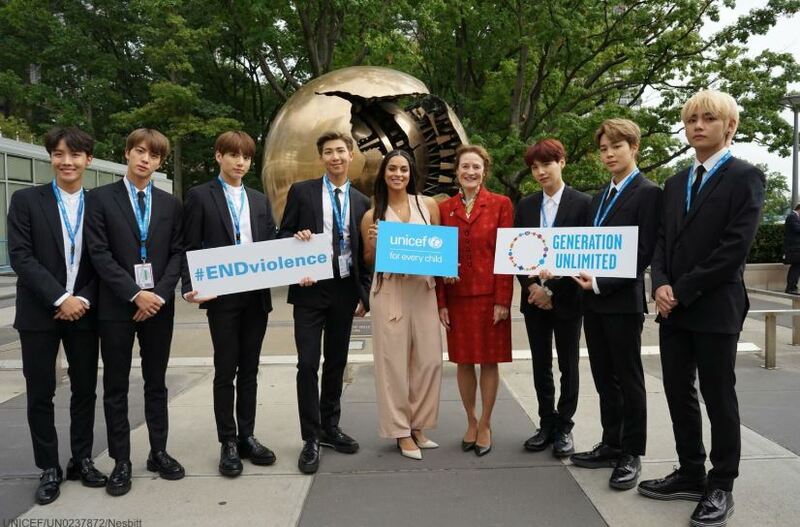 The leader of the group Kim Nam Joon aka RM delivered the speech, and why they partnered with UNICEF’s #LoveMyself campaign. Here is the complete speech of the Kim Nam Joon. “Thank you, Mr. Secretary General,, UNICEF executive director, and all the excellence and distinguished guests from across the world. My name is Kim Nam Joon, also known as RM, the leader of the group BTS. It is an incredible honor to be invited to an occasion with such significance for today’s young generation. Last November, BTS launched the Love Myself campaign with UNICEF, built in our belief that true love first begins with loving myself. We’ve been partnering with UNICEF’s End Violence program to protect children and young people all over the world from violence. And our fans have become a major part of this campaign with their action and with their enthusiasm. We truly have the best fans in the world. And I’d like to begin by talking about myself. 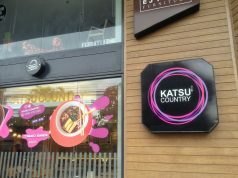 I was born in Ilsan, a city near Seoul, South Korea. It is a really beautiful place with a lake, hills, and even an annual flower festival. I spent a very happy childhood there and I was just an ordinary boy. I used to look up at the night sky and wonder, and I used to dream the dreams of a boy. I used to imagine that I was a superhero who could save the world. An intro to one of our early albums, there’s a line that says, “My heart stopped when I was maybe 9 or 10.” Looking back, I think that’s when I begin to worry about what other people thought of me and started seeing myself into the molds that other people made. Soon, I begin to shut out my own voice and started to listen to the voices of others. No one called out my name and neither did I. My heart stopped and my eyes closed shut. So, like this, I, we, all lost our names. We became like ghosts. But I had one sanctuary, and that was music. There was a small voice inside of me that said, “Wake up man, and listen to yourself.” But it took me quite a long time to hear music calling my real name. Even after making the decision to join BTS, there were a lot of hurdles. Some people might not believe, but most people thought that we were hopeless. And sometimes, I just wanted to quit. But I think I was very lucky that I didn’t give it all up. And I’m sure that I, and we, will keep stumbling and falling like this. BTS has become artists performing in those huge stadiums and selling millions of albums right now, but I am still an ordinary 24-year old guy. 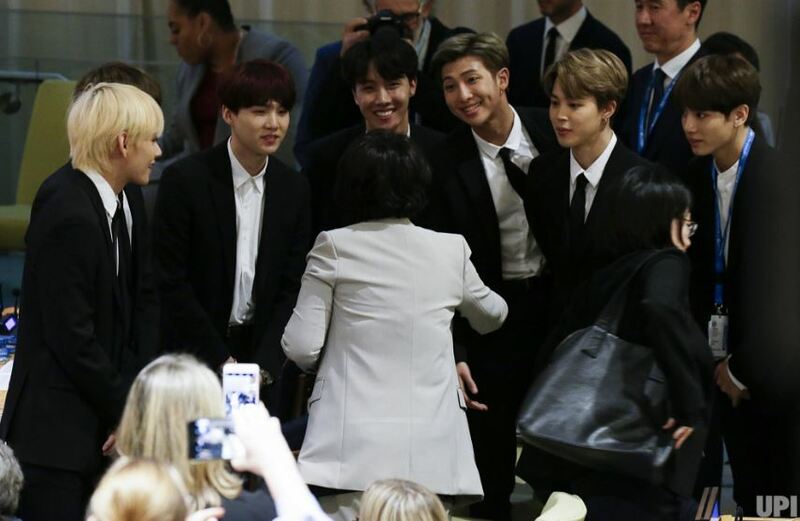 If there’s anything that I’ve achieved, it was only possible that I have my other BTS member right by my side and because of the love and the support that our ARMY fans all over the world made for us. And maybe I made a mistake yesterday, but yesterday’s me is still me. Today, I am who I am with all of my faults and my mistakes. Tomorrow, I might be a tiny bit wiser and that’d be me too. These faults and mistakes are what I am, making up the brightest stars in the constellation of my life. I have come to love myself for who I am, for who I was, and for who I hope to become. I’d like to say one last thing. 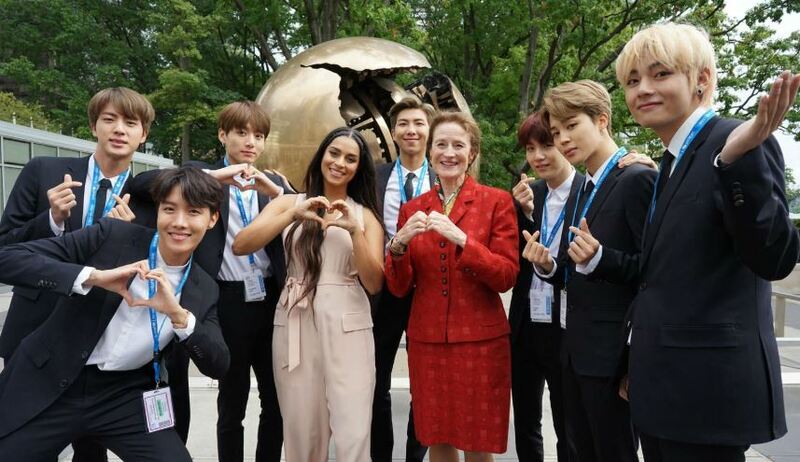 After releasing our Love Yourself albums and launching the Love Myself campaign, we started to hear remarkable stories from our fans all over the world – how our message helped them overcome their hardships in life and start loving themselves. Those stories constantly remind us of our responsibility. So let’s all take one more step. We have learned to love ourselves. So now I urge you to speak yourself. I’d like to ask all of you – what is your name? What excites you and makes your heart beat? Tell me your story. I want to hear your voice. I want to hear your conviction. No matter who you are, where you’re from, your skin color, your gender identity – just speak yourself. Find your name and find your voice by speaking yourself. I’m Kim Nam Joon and also RM of BTS. 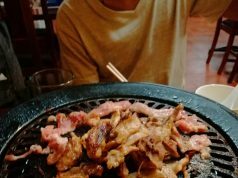 I am an idol and I am an artist from a small town in Korea. Like most people, I’ve made many and plenty mistakes in my life. I have many faults and I have many more fears, but I’m going to embrace myself as hard as I can. And I’m starting to love myself gradually just little by little. 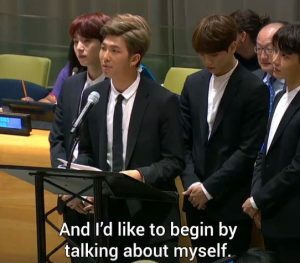 After the release of his speech during the United Nation General Assembly netizens buzzing and the #Namjoon became global trending in twitter with 1.16m tweets and counting as of this writing. The band is in the middle of their Love Yourself world tour. 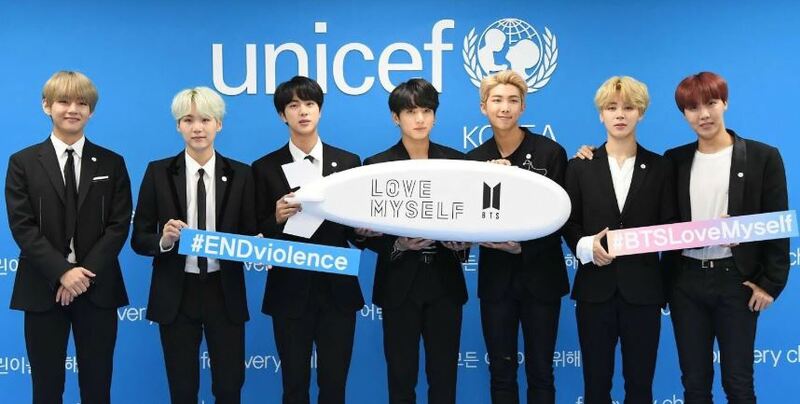 Back in November, the boy group partnered with UNICEF’s campaign #LoveMyself to end the violence against children and young people. Next articleGo Beyond the Usual: Can Agriculture be a blog?